Days Rental are pleased to announce that as part of our ever growing list of vehicles available to hire, we now offer the new Kubota Range. 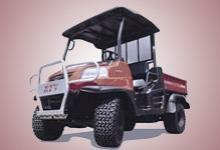 Thanks to its unique drivetrain arrangement, the RTV900 is a utility vehicle that goes where other utility vehicles can’t. Built on tractor technology, the RTV900 will take you comfortably through the most difficult terrain. Key features include hydrostatic drive, inboard wet-type disc brakes, power steering and independent front and semi rear suspension. To conquer the road less travelled, the RTV900 has all the right features off-road and on-road; the RTV900 Streetlegal Special provides the best of both worlds. Equipped with EC-compliant safety features, the Streetlegal Special lets you expand your capabilities by letting you take on either challenging, off-road terrain or cruise over paved roads and streets. For maximum protection and peace of mind, the RTV900 comes equipped with a heavy-duty, EC-compliant Rollover Protective Structure. To ensure the highest level of safety while driving on the road, the Streetlegal Special’s lighting system offers headlights, turn indicators, a rear-view mirror and reflectors. A rear license plate board makes attaching your plate fast and simple. Need to pull a trailer? No problem, the Streetlegal Special offers a sturdy trailer coupler. Whether you’re behind the steering wheel or you're a passenger, you’ll ride easy on the Streetlegal Special’s bucket seats.